With Luke turning two, I’ve noticed myself comparing where he is now to where Hope was when he was born. This isn’t a bad thing. She was only two months older than he is now and they’re similar in a lot of ways. She was starting to put together sentences. He’s stringing together words. She was very aware of people and places. We can’t go anywhere with Luke without him pointing out the nearest set of train tracks. And just as interesting as what they have in common at this stage, what’s next for him is just as exciting. Right after Luke was born, we started potty training Hope. This is definitely something in Luke’s near future. And every day, he’s becoming more and more of a little boy. It’s been a fun two years, but what comes next is even more exciting. I’ve written before about when both my children first started using the word “dada” to refer to me (for the record, Luke used it a lot sooner than he did “mama”). 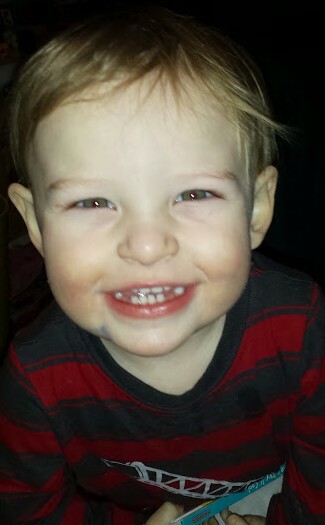 Luke would be turning 20 months tomorrow if February was like other months (but it doesn’t so he’s stuck at 19 months). His language keeps growing. The Civee and I estimate he has about 100 words. And I am two of them. Recently, Luke will see me, come up to me and go “Dada…Tom. Tom. Tom. Tom.” And he’ll repeat the use of Tom for a while. It doesn’t bother The Civee or I at all (there are probably worse things he could call me). One of the important parts of speech development at this stage is communication. And knowing multiple names for something is a good sign. Now if only I could get him to start using a King in front of that Tom. Hope has graduated from asking for stories to telling them. Her stories entertain everyone, including Luke. Tonight, we were having ribs for dinner and Hope started telling a story about mastodons (her favorite thing at the Ohio Historical Society Museum). I wasn’t able to record the first part (which started with “once upon a time”), but here’s the rest of it, until Hope gets distracted by some ribs. But then Luke chimes in with a song, which inspires Hope to sing too. Oh, and usually dinnertime at our house doesn’t look like Medieval Times, but hey, we were having ribs. I did something rare today: I watched TV news around dinnertime. The weather people were talking about the storm that hit Columbus last June 29. I’ll always remember that storm, but for a reason other than the storm and the damage it caused. While the storm was at its height that afternoon, Luke was being born. The rest of that day was a blur. In fact, the 12 months since have been a blur. Luke has grown, and is now doing typical toddler things: eating on his own, laughing, playing with his big sister and walking. His walking has improved so much in the past two weeks that we’ve had to re-childproof our house. At least we’ve had the practice of seeing Hope through these stages to help us with Luke. Having two is a lot of work, but it’s also a lot of fun. So happy birthday, Luke. It’s been a fun year. Author King TomPosted on June 29, 2013 June 29, 2013 Categories Luke4 Comments on Happy Birthday Luke! So it’s been a while since I’ve posted anything. And not because there’s been nothing going on. There’s been a lot happening. The Civee and I have been trying to keep up with a three-year-old and an almost-one-year-old who are growing every day. We’ve been spending a lot of time outside this spring, especially now that the mosquito defense system is active. Hope has been helping out in the garden and has been a great help with our strawberries. Last year, I thought we had a lot of strawberries. But this year, there were a few days in a row where we picked more than a hundred each day. It got to be so much that we just stopped counting. I should mention that Hope picked most of those. She’s getting to be very helpful. But probably the best thing about her and Luke growing is they’re growing together. Now that Luke has a personality and can move around and react, they’re starting to have a lot of fun with each other. Sure they’re cute together, but I think they’re going to be trouble. Last weekend, the weather was amazing. Very spring-like. This weekend, the weather is not any of those things. Here are Hope and Luke from last Sunday, Luke’s first time in swing. I think he had fun.